Forget simple spaghetti: We’re going rogue with farfalle, maltagliati, and garganelli. If you've mastered our primer on how to make fresh, handmade pasta without a machine, it’s time to step it up a notch. 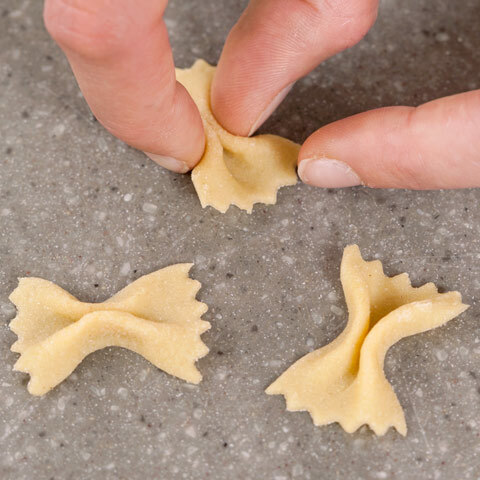 If you thought that shaped pasta from scratch was out of your range, think again: Making shapes like farfalle, maltagliati, and garganelli is simpler than it looks. We'll show you how. When you roll out the dough, pay attention to visual cues: The dough should be rolled thin enough that the outline of your fingers is visible through it. Don’t worry so much about the final dimensions. 1. 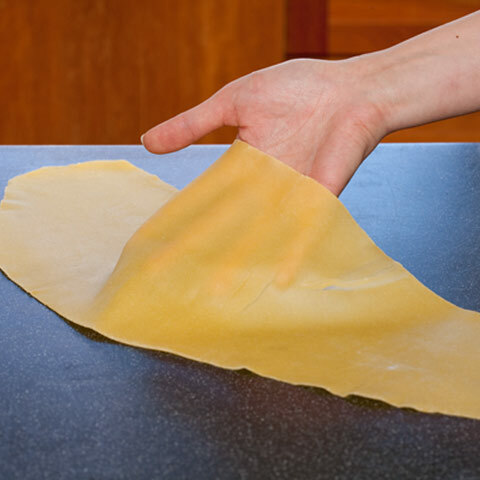 With the short end of the pasta sheet facing you, cut the pasta at a 45-degree diagonal into 1-inch strips. 2. 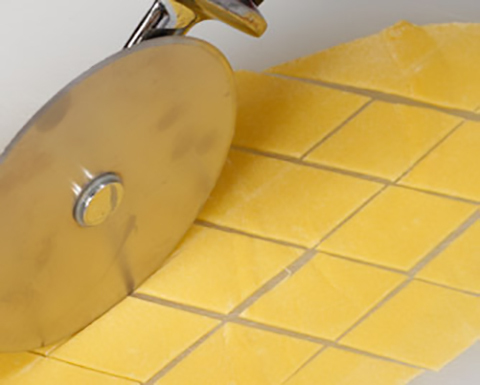 Cut the pasta sheet again, perpendicular to the first cut, to create rough diamond-shaped pieces of pasta. 1. Cut the sheet of dough into 1- by 1 1/2-inch rectangles, using a fluted cutter to cut the short side of the rectangle. 2. Place the index finger of one hand in center of rectangle. Using your thumb and the index finger of other your hand, pinch in the long sides of the rectangle until they reach the finger in the center of the pasta. Remove your finger and firmly pinch the center together. 1. Lay a 1 1/2-inch square of pasta diagonally on the counter. 2. 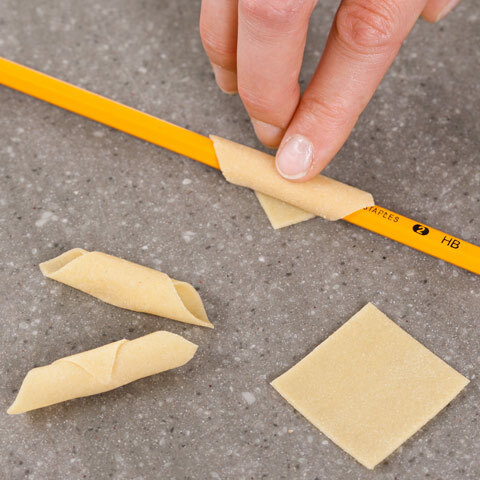 Wrap one corner of the square around a pen or a pencil, and with gentle pressure, push it away from you until the pasta is completely wrapped around the pen. Slide the shaped pasta off the pen and repeat. Once each piece of pasta has been shaped it should be transferred to lightly floured rimmed baking sheet. Like the strand pasta, the shaped pasta should be cooked within an hour of being shaped or frozen. 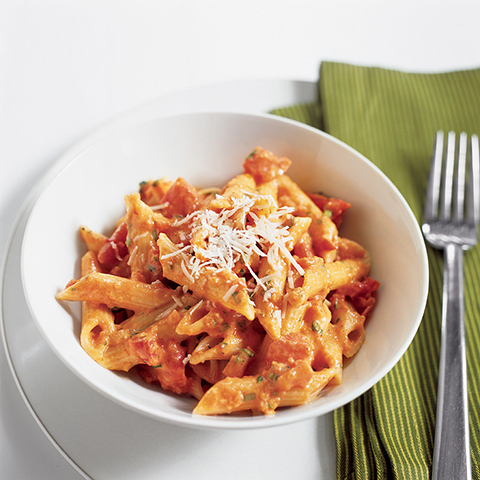 Put your homemade garganelli to work in our recipe for Penne alla Vodka. Splashes of vodka and cream can turn run-of-the-mill tomato sauce into luxurious restaurant fare—or a heavy, boozy mistake. We set out to make our vodka sauce be the best version of itself. When it comes to the best canned tomatoes, is Italian pedigree the determining factor, or do the sweetest, brightest-tasting specimens come from this side of the Atlantic?